As the mighty Ganges River overflowed its banks this past week following heavy monsoon rains, large parts of the Hindu holy town of Varanasi were submerged by floodwaters, keeping away thousands of devotees. 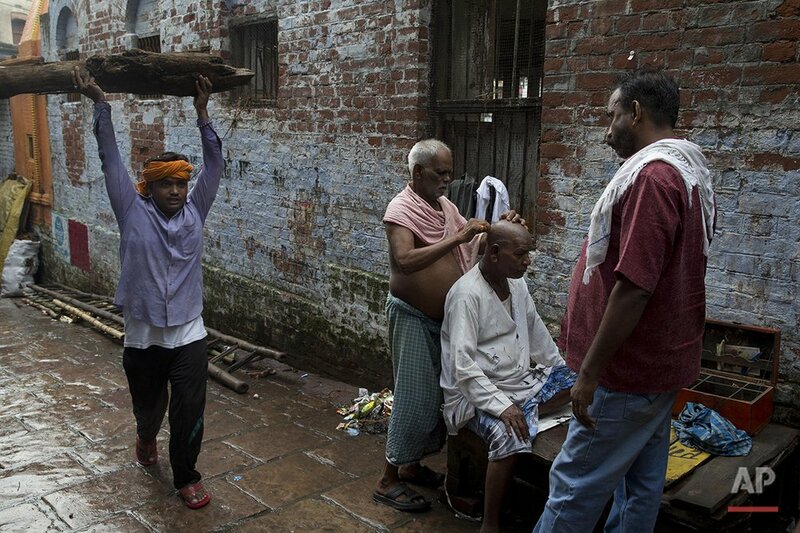 Varanasi, located in northern India, is a pilgrim town that Hindus visit to take a dip in the holy Ganges. Devout Hindus believe that if they are cremated on Varanasi's ghats, or steps leading to the river, they earn immediate salvation and are freed from the cycle of birth and death. The ones most affected by the floods are those who have come to the town to cremate their loved ones. 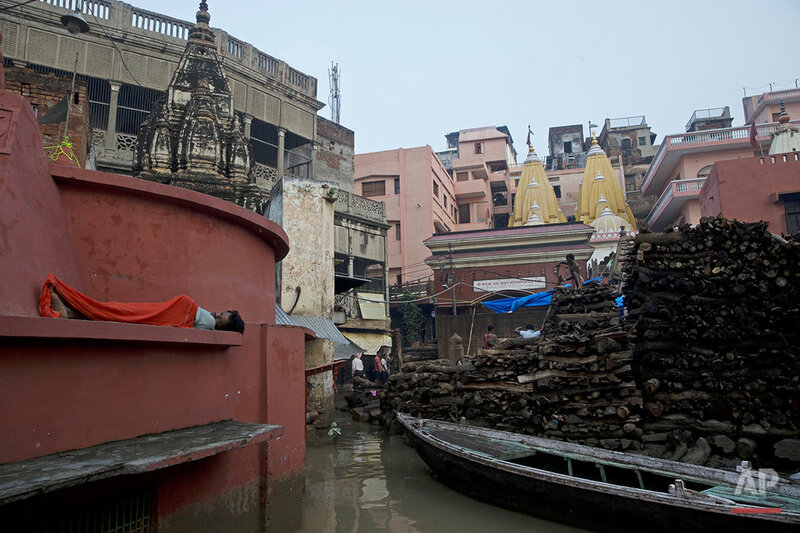 The floodwaters have submerged the popular Manikarnika ghat and several others, forcing local officials to appeal to people not to bring their dead for a traditional cremation in Varanasi. On Friday, some funeral pyres were lit on the roofs of the houses located near the ghats because lower areas were under water. Groups of people carrying the bodies of their relatives thronged the single stretch of the river where funerals were still being held as the Ganges' raging waters swirled nearby. Meanwhile, local boatmen who ferry pilgrims and grieving family members to the cremation sites have hiked their rates, realizing that people could not carry the dead to the ghats. 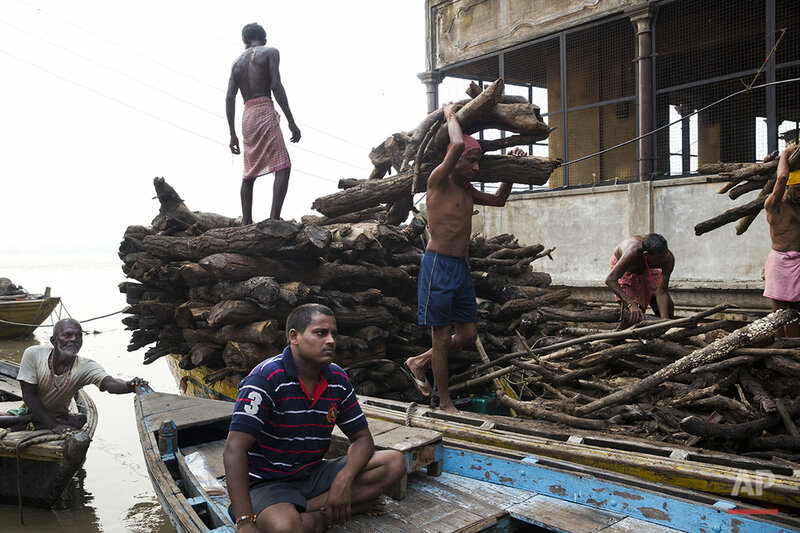 Lumber traders have upped the price of wood used for the funeral pyres. More than 200,000 people in Uttar Pradesh state, where Varanasi is located, have been evacuated and are living in relief camps, with floodwaters entering homes in about 800 villages across large swaths of the state. Floods are an annual occurrence in many parts of northern and eastern India during the June-September monsoon season. Text from the AP news story, AP PHOTOS: Ganges overflows its banks in Indian holy town, by Tsering Topgyal.